PADI eLearning Scuba Diving Course | Scuba Center | Start your PADI Scuba Diving training today... online. | PADI eLearning Online Courses. PADI eLearning is internet based (online) course work that you can access from anywhere via the world wide web. With PADI eLearning, you can sign-up and complete the knowledge-based dive training from the convenience of your home, office or on the road, 24 hours a day, seven days a week. PADI's eLearning system gives you the flexibility to study course material at your own pace. However, during the course, you can access the support of a PADI Professional at Scuba Center by email or phone to get guidance and help about the topic you are studying. After completing the online knowledge-based portion of the course, the PADI eLearning system plugs you into training with your PADI Instructor at Scuba Center for the best part: diving! eLearning makes your diver education more convenient, more effective and more fun than ever! PADI's eLearning system brings student divers all the benefits of computer based training, including student guidance, knowledge of results, flexibility and learner-based pacing. PADI eLearning provides the flexibility to attend knowledge development with minimal, fixed classroom time to help meet the demands of daily schedules and maximizing in water experience. Although eLearning diver education classes begin on the internet, they continue and conclude at Scuba Center. Payment is $190 US (nonrefundable) for eLearning via a secure online payment system. There are additional charges for in-water training and snorkeling equipment. You will need to complete a PADI Student Record File (which includes a Medical Statement). If you answer yes to any of the medical history questions, the PADI Medical Statement must be signed by your physician prior to your first pool session. If you require a physicians approval, we recommend you also retaining an extra copy of the signed Medical Statement for your records / referral paperwork. The PADI Open Water Diver Course online will take a minimum of approximately 12-15 hours to complete. Do I need to complete any additional academic work? To help ensure that required knowledge is understood and retained, you will be asked to complete a "Quick Review" quiz. Since eLearners have already been assessed via study questions, knowledge reviews, quizzes and exams, the Quick Review should be very straightforward. We will remediate any questions missed and document completion of the Quick Review on the Student Record File. When possible, it is recommended that you stop in to one of our two locations prior to the day of your first pool session. If this does not fit your schedule, plan on taking the Quick Review immediately after your first pool session. Fee for completing the pool portion (Confined Water) with Scuba Center is $125.00. Each student will also need to purchase a PADI logbook, mask, fins, and snorkel). 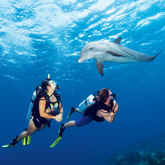 You will need to provide your own mask, fins, and snorkel, as these are individually fitted items. Please make sure that you have scuba rated fins. The fins you have for snorkeling may not have the power required when you add the additional drag of the scuba tank, buoyancy compensator, weight belt, wetsuit, etc. Also, your mask should be a high quality silicone rubber to insure the best seal to your face. A mask that leaks on the surface may be a nuisance, but one that leaks at 60 feet is more problematic. Our highly experienced staff of diving professionals can assist you in selecting the appropriate items at either of our two locations. Allow time to get the best fit and service possible. Do not wait until the day of your first class session (For weekend dates... Pool Sessions start at 9am on Saturdays, store locations do not open until 10am). You will also need a swimsuit and towel for your pool sessions. You need to complete the online knowledge-based portion of the course, (PADI eLearning) and complete knowledge reviews at the end of each module. You also need to complete a PADI Student Record File (which includes a Medical Statement). If you answer yes to any of the medical history questions, the PADI Medical Statement must be signed by your physician prior to your first pool session. You can download and review the PADI Medical Statement here. If you require a physicians approval, we recommend you also retaining an extra copy of the signed Medical Statement for your records. Where are the pool sessions held? Pool sessions are held at our Eagan location with its own on-site heated indoor pool. Yes, we can organize private pool sessions for an individual or a group. The private lesson fee is $250 for the first person, $125 for each additional person. You can register for your pool sessions over the phone with a credit card (pre-payment required) or by stopping in at either Scuba Center location.